In the sensational world of Formula One, one can always expect wheel to wheel raging action. Stellar drives, amazing records and standout performances pretty much function as the engine, fuel and chassis of a sport that certainly knows how to thrill and produce unstoppable entertainment. But this is also a sport where unpredictability reigns supreme and where a single hapless drive or a stellar run through the circuit can make or break destinies. The sport whose inaugural season commenced way back in 1950 and one where names such as Schumacher, Prost, Senna, Vettel and Alonso have become cornerstones for greatness embraces every now and again a special talent in whose hands lies its future. 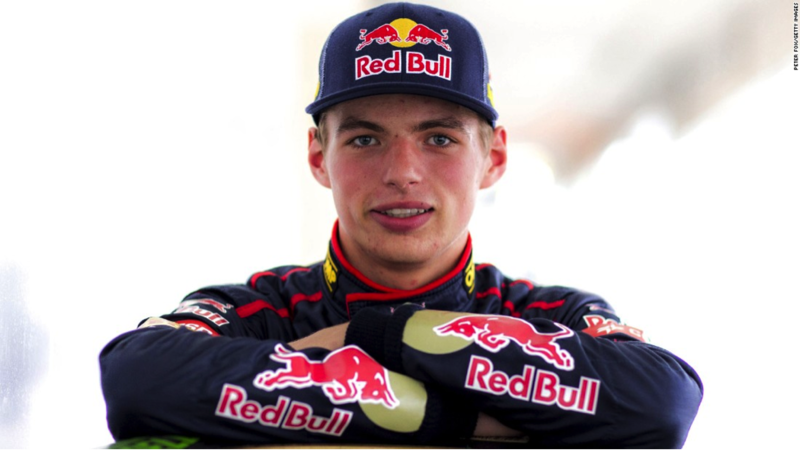 And with the 2016 season well underway, having already produced 6 sensational races, the events at Spanish grand prix unfurled the name that perhaps the entire Formula One contingent had been waiting to hail: Max Verstappen. After the enthralling 66 lap contest finished at the Catalunya, the world didn’t see the suave German Nico Rosberg, or the Triple World Champion Lewis Hamilton on the podium. Occupying center-stage in the midst of a deafening crowd was one young prodigy, the 18 year old sensation from The Netherlands. To all it was clear: Max’s moment had come. Just a race before, at Shanghai in China, in the terse Chinese battle, the opening lap fiasco of Red Bull (Max’s current team) saw an unmistakably mad collision between Red Bull’s Daniil Kvyat and Ferrari’s Sebastian Vettel, the latter’s car being damaged to the extent of Vettel losing out his first lap advantage to Rosberg, P1. 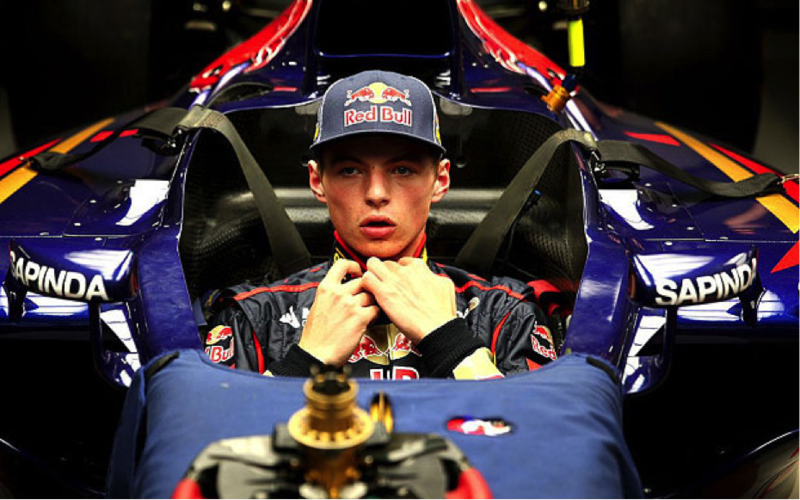 Kvyat would continue undeterred and recovered post the first lap collision to finish 3rd on podium. At the conclusion of the Chinese speed fest, Max Verstappen comfortably drove home his Red Bull powered Toro Rosso to P9, earning 2 valuable points, remaining completely unaware of what would become of him in the following race at Spain. But in that exact moment where Red Bull’s Kvyat justified his controversial space bickering move on Vettel in the post-race conference, it seemed that to Christian Horner(Red Bull Team Principal), clearly Max’s biggest backer at the moment one thing was clear: Kvyat would go out from Red Bull and Max would be given a driving seat alongside Aussie Daniel Ricciardo. That was Max’s big moment and he ceased it. In the last 2 years, Formula One has largely become a slugfest of two reigning names in the modern day sport: Nico Rosberg and Lewis Hamilton, the latter winning 2 of his 3 world titles with Mercedes. 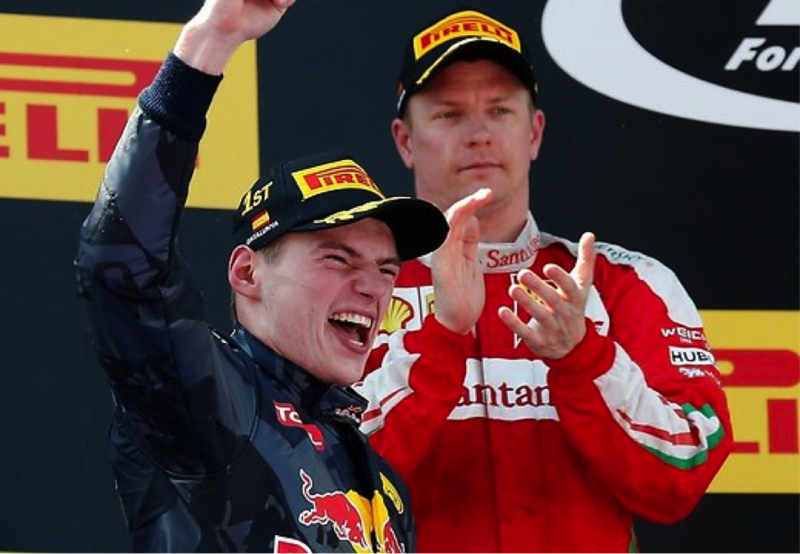 But neither of them were able to take advantage at Catalunya, where their first lap collision saw F1’s current sensation Max Verstappen take race lead holding on to P1 to dominate 65 more laps, eventually going on to win his maiden race in front of a crowd that had assembled to perhaps witness another Nico show. 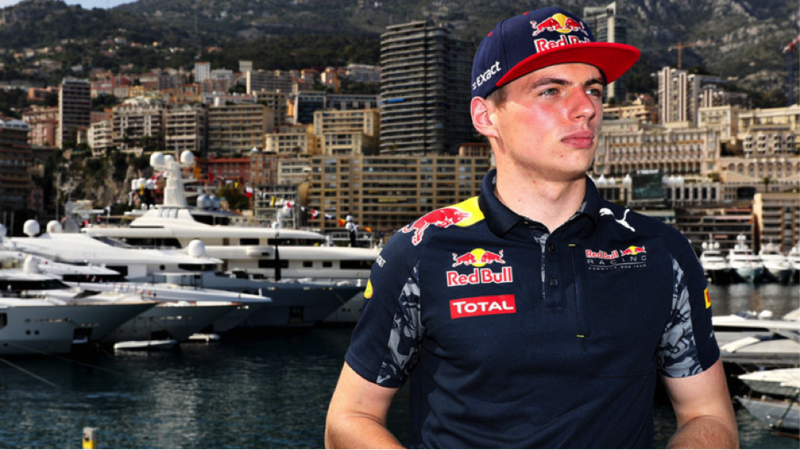 Fast, edgy and unpredictably quick, in the just concluded race right before the Monaco Grand Prix Max Verstappen justified Horner’s gamble and swayed hearts with his sensational and tactically brilliant drive. From the very onset, he had the race pace and even Ferrari’s Kimi Raikkonen, following closely on Max’s Red Bull’s tail couldn’t manage to get past the Max charge. In actuality, while the Hasselt, Belgium born Netherland racer has driven in 25 races, making his debut in 2015, Max only recently cleared his civil driving test, securing his license. So in many ways, his phenomenal rise in Formula One’s star studded galaxy is a mind boggling one! Just how many young drivers manage to make it to a top notch Formula One seat with them yet to secure their personal driving license? He’s regarded as fearless, brave and natural, words that often come to mind when essaying the meteoric rise of past greats such as Senna and Schumacher. And perhaps it is no irony that in a contest of utter skill where it can get nervy as you approach every turn and glide past every corner, you cannot help but drive with these gladiator like virtues that finally determine where you stand. The Dutchman was always marked for greatness. Back in the day, when he was signed up for the Red Bull’s Young Driver Program, Max was merely 15 but never short of the confidence that seemed to remind one that here was a man who seemed determined to move mountains. From his contemporaries, the closest to match Max’s skill in car handling, never mind raw pace is Spanish Carlos Sainz Jr., currently driving for Toro Rosso Ferrari. 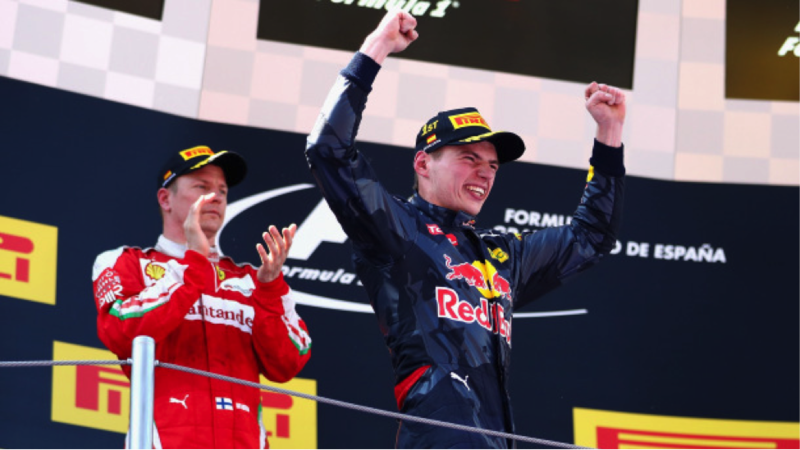 Before the Spanish grand prix, he was Max’s teammate when the call up to Red Bull escalated Verstappen’s fortune. Sainz Jr. has featured in 25 race starts and is yet to make it to the podium. You can only be shocked if not completely taken aback by the strange realization that 28 year old Nico Hulkenberg, 10 years senior to Max hasn’t yet made it to the podium despite entering 102 races. 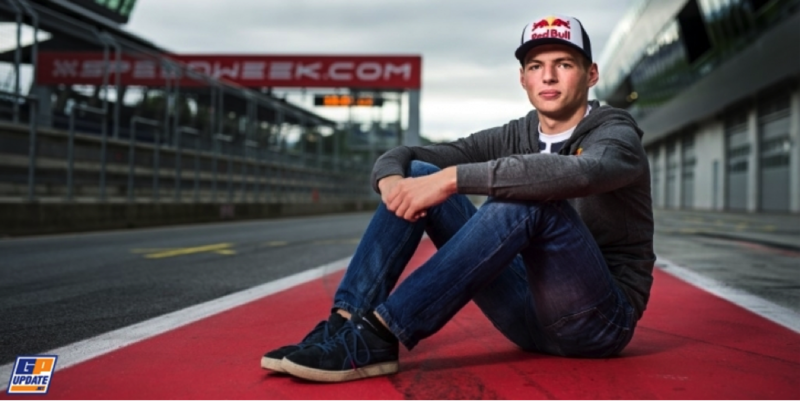 In that context, even as you realize that comparisons lead to a downfall and are often a lop sided biased version of events, Max’s mercurial race win in his very first drive at Red Bull confirms his status as the very best in the ‘next generation’ of F1 drivers. Kimi Raikkonen, 36, who is clearly double of Verstappen’s age confided to the media that, “the fact that I competed alongside his father once” talks about the Verstappen family’s superior skill in the Formula One car. He’s got racing in his DNA and some fire in his belly. His eyes convey that a true predator of the lackadaisical has arrived on the big circuit who will leave no move untried at leaving his contemporaries shocked and bewildered by his skill. 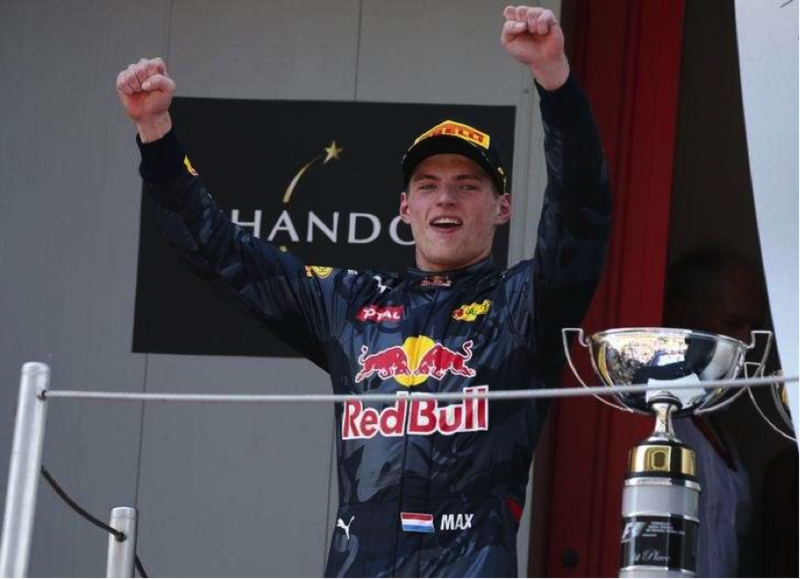 Max Verstappen’s dad Jos Verstappen too drove in the glitzy world of Formula One. He was titled Jos “The Boss” for his skill and dexterity in the F1 car. But Jos was always careful about revealing his son, like how the king of a pride of lions safely guards the cub who will grow up to roar the loudest. But when you analyze Max’s F1 motorsports journey that has plenty of miles in it, you think of the importance that manifestation of raw talent holds in making the future of a bright star. 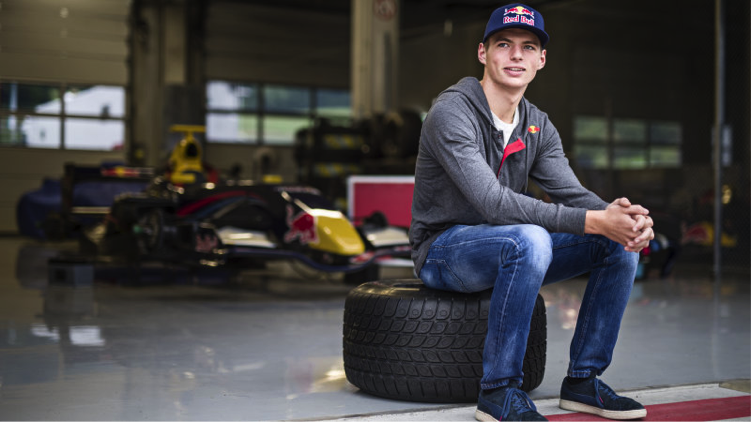 Till 2014, whilst Verstappen was competing in European Formula 3 Championships, he was enrolled in the Red Bull junior team. But that wasn’t the only reason why he got an F1 seat so quickly, perhaps at lightning speed! The invaluable experience and tutelage of Toro Rosso’s Franz Tost has been instrumental in giving many young drivers their first break and Red Bull is a set up that always sets its eyes on spirited talent and therefore, Max’s driving for them sooner or later was only a sign of eventuality as much as it is a fruition of his single minded focus and unwavering determination. Some call him a Vettel in making. Others have already begun to see shades of Ayrton. But for now, let’s just contend with the fact that we have among us a truly talented speedster whose name indicates ‘Max’imum fun and enthralling entertainment for an entire generation of Formula One fans who watch races to anticipate miracles to happen in broad daylight. Max may just have answered this divine call!